Nautilus-actions configuration tool, which was needed in order to have context menu actions in Nautilus doesn't seem available in the Software center in 18.04 LTS. This is not a Gnome-Nautilus feature, I think, as suggested in a comment, because I have seen the same Nautilus version 3.26.3 in Solus Linux, and there Nautilus Actions is available and usable. Solus provides also in its repo a different program called FileManager Configuration Tool, run with fma-config-tool, which excepting the name is identical and can be used only alternatively to the Nautilus actions usual tool. But none of them is available in Ubuntu, no matter the repos enabled in software sources settings. How can Nautilus Actions tool (or its alternative) be installed in Ubuntu 18.04 in order to get the custom context menu actions? Please do not answer by proposing other file managers. I know that there are file managers that have custom actions - in fact all those used by the main Linux systems and by the main systems of the Ubuntu family have them: Caja, Nemo, PCManFM, Thunar, Dolphin, Pantheon-Files. But I am not asking about that here. After installation you can launch fma-config-tool. Modern version of Nautilus Actions (nautilus-actions package in trusty (14.04 LTS), xenial (16.04 LTS), artful (17.10)) are named as FileManager Actions (filemanager-actions package, it is not yet packaged in Debian and Ubuntu - see at repology.org). If you do not want to compile packages by yourself - use links in the end of this answer. Note: if you need to support all three file-managers you should install two additional packages before compilation with sudo apt-get install libnemo-extension-dev libcaja-extension-dev. only Nautilus support - download filemanager-actions_3.4-1_amd64.deb-package (also here). all three file-managers (Nautilus, Caja and Nemo) support - download filemanager-actions_3.4-1_amd64.deb-package. I've just upgraded from Ubuntu 16.04LTS to 18.04LTS, and find myself missing nautilus-actions as well. I tried installing caja-actions (as it doesn't depend on caja) on the off-chance it'd automatically work with nautilus, but unfortunately it does not. According to the github page for nautilus-actions, it's been deprecated and renamed FileManager-Actions. I can't find a filemanager-actions package in Ubuntu 18.04, although there are source packages available at that 2nd link. So our best shot might be to wait until we can't stand living without it any longer, then compile/tinker, depending on what state it's in. I already had some development tools installed (gcc, make, etc). Installing the 'build-essential' package should get you everything you need. After that I had to log out of GNOME, then back in, before filemanager-actions items appeared in the Nautilus right-click menu. forget nautilus-actions, try nautilus-python, you can find examples inside usr/share/doc/python-nautilus/examples/. How do I customize the context menu in Nautilus? How to make nautilus use file-roller in 17.10 like in 17.04? How to edit target path of broken symbolic link from GUI? Right-click convert PDF to JPG? How do I make nautilus use file-roller in Ubuntu 18.04 and above like in 17.04? How can I reinstate file roller/ archive manager to work with Nautilus, in Ubuntu 18.04? What is an alternative for Nautilus Actions in MATE DE? How can I add a custom item to the nautilus context menu, but NOT in a sub-menu? 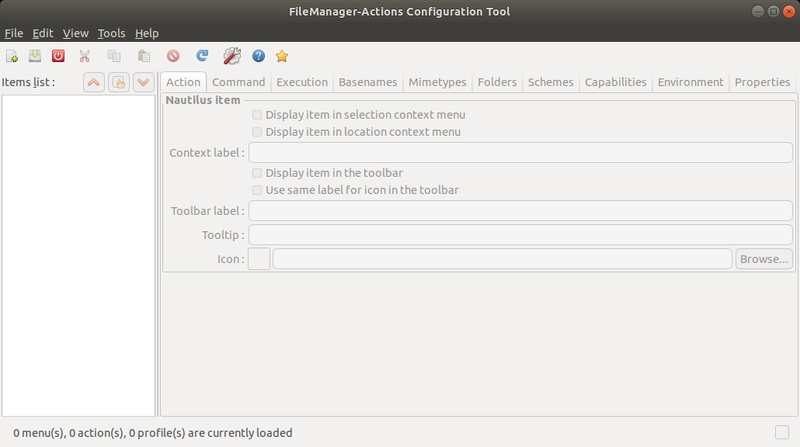 Where does Nautilus-actions configuration tool save actions? multiple 'open with' applications in right-click context menu with nautilus/filemanager-actions?